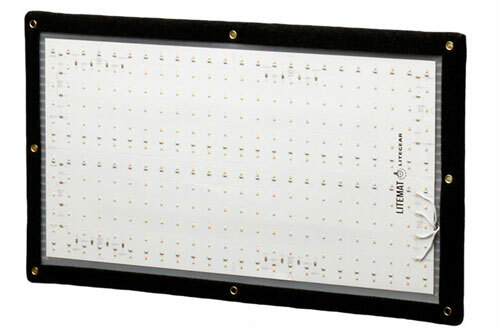 The LiteMat 1 is based on one “tiled” light engine measuring 9.5 in. x 19 in. (240 mm x 480 mm). The head unit features 288 genuine VHO Pro LEDs and is covered by a thin, clear polycarbonate layer and bordered entirely with Velcro® “loop” fastener. Mounting is provided with a removable, Kino Flo®-compatible, gimbal mount. The “soft-through-pixelization” method allows the LiteMat 1 to achieve surprisingly bright light levels while remaining under 1 in. thick and weighing just 2.3 lb. LiteMat Tungsten provides an incandescent-like color that appears warm to the eye and to the camera. Performing at 3200K and 95 CRI, LiteMat Tungsten is named for the metallic element that has been commonly associated with incandescent lighting. 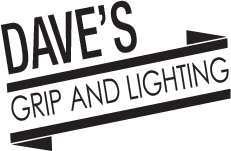 It beautifully mixes with legacy tungsten and halogen light sources and dims without Kelvin temperature shift. LiteMat Daylite provides midday, sun-like hues that can be used to boost available daylight without the use of f ilters. Performing at 6000K and 95 CRI, LiteMat Daylite is named for the industry term used for other daylight, color-correct technologies like f luorescent and HMI. It has more in common with these other technologies than its name. LiteMat Daylite has been designed to match color and spectrum making it easy to openly mix light sources and lighting technologies. LiteMat Hybrid provides all the benefits of LiteMat Tungsten and Daylite along with the range of Kelvin temperatures between 3200K and 6000K. This obvious advantage allows your LiteMat to always provide the required white balance without the need for f ilters. When used with our LiteDimmer Hybrid, you get granular control of Kelvin temperature along with master brightness, and with its low mode, it is possible to achieve ultra precise low-light level control. LiteMat can be used anytime that soft and controllable light is required. As a key light, you can easily mount the unit on a “Baby” stand or attach it to an elevator wall with adhesive Velcro®. Because it’s lightweight, LiteMat makes a great handheld fill light or can easily be mounted overhead.